A recent Silver Alert showcased how teamwork and coordination between the Washington State Patrol (WSP), the traveling public and our staff can result in a positive outcome. On February 1, WSP issued a Silver Alert out of Lacey and provided a vehicle description with a license plate. Our Transportation Management Center operators located in Tacoma entered the information and activated several electronic highway signs on Interstate 5 in Thurston and Pierce counties. A few moments later, WSP reported to the TMC that a driver called 911 saying he was right behind a vehicle that had the same license plate that was listed on the electronic sign. The driver gave his location and vehicle description. 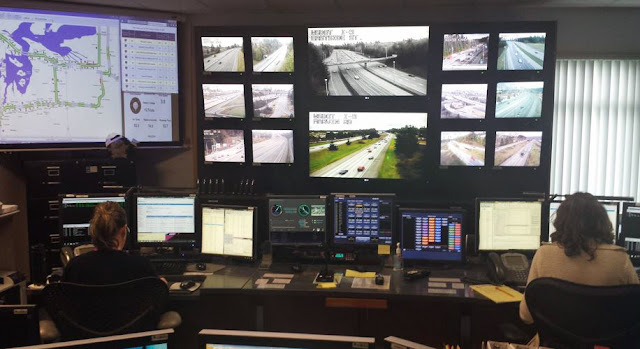 This allowed TMC operator Amy Morrison to use the traffic cameras to find the missing elderly person’s vehicle, and track it until law enforcement could intervene. during an active Silver Alert thanks to the heads-up action of a driver. Not all Silver Alerts end on a positive note, and many times, the public may never hear the outcome. But on Feb. 1, there was a happy result. Every now and then we are reminded that processes used to notify the public of a Silver Alert really do work. This happy outcome wouldn’t have happened if a driver hadn’t called 911 to report it. In August 2015, we began the practice of providing Silver Alert messages on the state’s electronic highway signs for endangered missing people who are 60 years or older, as long as the vehicle information is included. We receive the information from WSP. We’re glad this situation turned out well and we send a big thanks to the State Patrol and the driver who helped the missing person get home safely. If you see a Silver Alert and believe you have information that could help, please call 911 when you safely can do so with the information!